And the Fireball tour has arrived also this year and it has brought around the UK three of the finest punk rock bands from the U.S., Reel Big Fish, Anti-Flag and Mad Caddies, plus some local bands who have won the competition. The London date was held at the O2 Forum in Kentish Town, and, yeah, of course, I was a little bit late, so I missed the local band and Sweet Little Machine but I was on time to shot one or two Fireball! So, my gig started with the Mad Caddies, the Californian ska punk band, which fuelled up the crowd with their mix of punk, ska and reggae songs such as 'Drinking for 11' and ' Souls for sale'. It was the first time that I saw them live and I have to say that, they're really good! 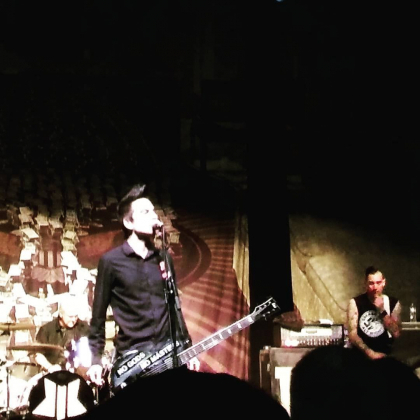 And then came the time for one of the most powerful bands, Anti-Flag! Yes, I have to admit that I really love them and all their songs, so when they started playing I just went totally crazy! Some new songs, one of the new ones, 'When the Wall Falls' sees the participation of the Reel Big Fish, some already classic songs such as Die for the Government, and of course, Brandenburg Gate played among the crowd! Amazing! Just the time to drink another shot and chat a little with the guys of Sea Shepherd and the Reel Big Fish started playing! The Californian ska band knows how to make people move their feet, especially with songs such as Brown Eyed Girl, Another F.U. Song and a cover of Monkey Man. What can I add, it was a special night, followed by a special afternoon thanks to Anti Flag and the guys at the Bull and Gate pub which organized an acoustic session with the band and a listening party for their upcoming album, 'American Fall'. A special thanks to the blond girl that let me take Pat's drumstick! Hope you're sound and safe!